What Are the Causes of Biotin Deficiency? Biotin is one of the B-complex vitamins and is essential to your body's health. Important for converting carbohydrates into energy, biotin also helps metabolize fats and protein. As with all B vitamins, biotin helps keep your hair, skin, eyes, liver and nervous system strong and healthy, says the University of Maryland Medical Center. If you're deficient in vitamin B, these parts of your body may suffer. Although biotin deficiency is not common, there are several notable causes. According to the Linus Pauling Institute at Oregon State University, true biotin deficiency is rare. However, some situations may cause biotin deficiency. The consumption of large numbers of egg whites daily for a prolonged period -- weeks to years -- can cause biotin depletion, because egg whites contain a protein that prevents biotin absorption. Other causes include long-term use of antibiotics, which may deplete biotin-producing intestinal flora; the use of parenteral nutrition for extended periods; and certain disorders of absorption, says the University of Maryland Medical Center. The symptoms of biotin deficiency include scaly skin, brittle nails, thinning hair, dry eyes, fatigue, loss of appetite, depression and cracks in the corners of the mouth. The best source of biotin is animal organ meats, such as liver and kidney, says North Carolina State University. However, numerous other foods also contain biotin, including egg yolks, soybeans, brewer's yeast, rice bran, cooked oats, bananas, wheat, nuts and milk. In addition, certain bacteria that exist naturally in your intestinal tract produce biotin for your body's use. 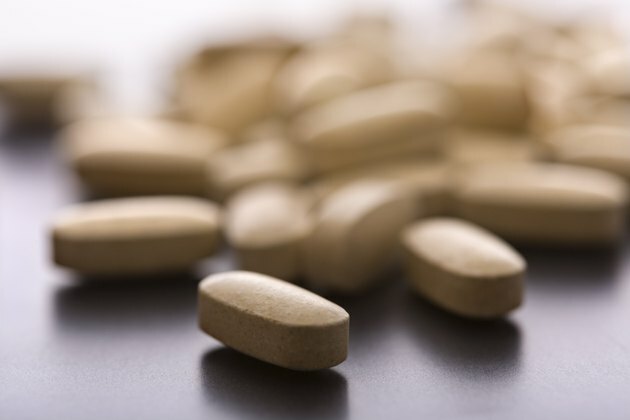 If you are biotin deficient, there are steps you can take to increase your biotin level. Biotin is available in supplement form -- in daily multivitamins, as part of B-complex vitamin supplements and in separate supplements by itself. You may also include more biotin-rich foods into your diet and reduce your intake of any biotin-lowering foods, such as egg whites, if you have been consuming large amounts of them. Consult your physician before you take any vitamin supplement. Although they may seem natural and healthy, even vitamin supplements can cause unpleasant side effects in some people or interact problematically with certain medications. Your physician can also evaluate whether you are truly deficient in biotin. North Carolina State University; Biotin; Chinwe Coretta, et al. Can You Take Biotin While Pregnant?